President Obama’s $60.4 billion request for Hurricane Sandy relief has morphed into a huge Christmas stocking of goodies for federal agencies and even the state of Alaska, The Post has learned. But the Sandy name was on the bill, it was not palatable for fiscal conservatives, and I agree with Legal Insurrection’s Fuzzy Slippers—the Democrats knew it would trash Republicans, who suffered a bruising and demoralizing 2012 campaign season. So, yeah—it’s a bit more nuanced than the evil GOP didn’t want to vote for an aide package. It contained crap spending in it. 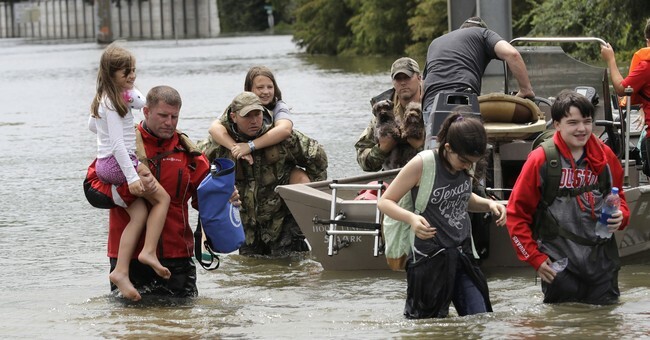 While some on the Left and the news media take these pot shots, the residents of Houston are trying to figure out how to survive the hundreds of billions of gallons of rain that have deluged the area. There will be a time to debate and discuss this relief package as well, just not now.